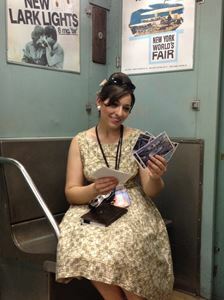 - Margaret Stephens (NYTM, 2014), a bubbly aspiring journalist headed to the amazing 1964 World's Fair! Get a glimpse into the innovative pavilions and festivities of the Fair, as well as highlights the changing political and music scenes of the mid-1960's. - Blanche Perkins (DAR, 2016), served as National Chair of the DAR Ellis Island Committee in the 1920s, who handed out the new , multi-language DAR Manual for Citizenship to immigrant detainees and offered an occupational work program. 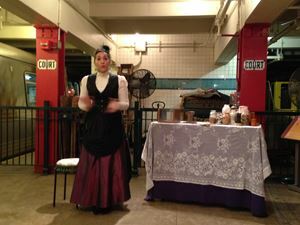 Photo backstage of opening night of the 125th DAR Continental Congress in Washington, D.C.
- Mary Walton (NYTM, present), Based on a real citizen-scientist, students learn about life in the 1800's and the noise-pollution problem that plagued New York's elevated railroad. By experimenting with a number of sound-absorbing materials, they'll help Mary find a solution to quiet the trains, leading to her groundbreaking patent! - Mabel Kline (NYTM, 2013), one of the first female subway conductors during World War I. Mabel takes visitors on an adventure down New York's IRT subway line, giving them a glimpse into the hectic life of a subway conductor and discussing how subways have changed over time. 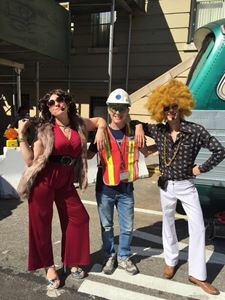 - "Deb" (NYTM, 2016), roaming character promoting the 40th Anniversary of the New York Transit Museum during "Bus Fest" 2016. 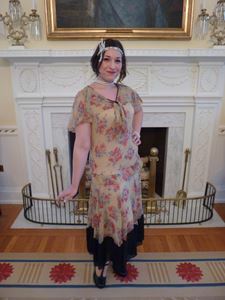 Deb is an aspiring comedian who loves disco and picking on her older brother Donnie. - Electricity Live! 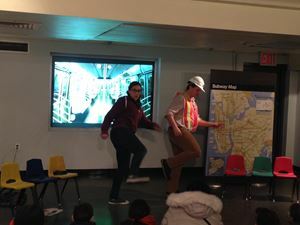 (NYTM, 2015), Discover the secrets of how electric current travels along the third rail to power the NYC subway in this electrifying, learn-out-loud, interactive show. 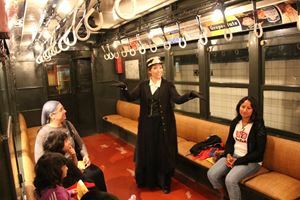 We'll travel through time and meet with some of history's greatest inventors to get the subway (and you) moving! 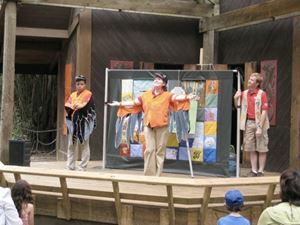 - Wildlife Theater (Bronx Zoo, 2008), a theater troupe performing educational plays, songs, games and puppet shows about nature and conservation throughout the zoo! Photo from a performance of "The Great Migration Adventure."